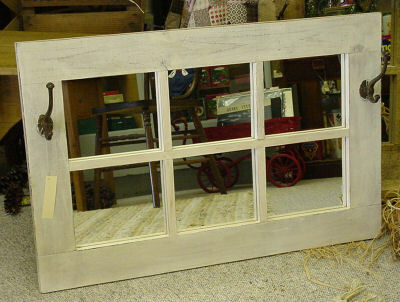 This this is another Distressed Country Window or Distressed Country Mirror that we added antique coat hooks to. It is made of pine and can be made what ever size or color you need to fit your space. If you want this made just for you.. Contact us, Tell us what you want, We'll make it. Customer Pickup and Local Delivery Only. If you e-mail us please include your phone number and where you are from.